What sane woman would consider becoming any man’s ninth wife? Bess Gray is a thirty-five-year-old folklorist and amateur martial artist living in Washington, DC. Just as she’s about to give up all hope of marriage, she meets Rory, a charming Irish musician, and they fall in love. But Rory is a man with a secret, which he confesses to Bess when he asks for her hand: He’s been married eight times before. Shocked, Bess embarks on a quest she feels she must undertake before she can give him an answer. With her bickering grandparents (married sixty-five years), her gay neighbor (himself a mystery), a shar-pei named Stella, and a mannequin named Peace, Bess sets out on a cross-country journey—unbeknownst to Rory—to seek out and question the wives who came before. What she discovers about her own past is far more than she bargained for. 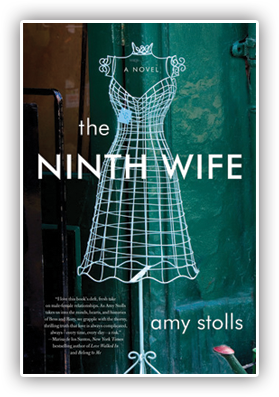 The Ninth Wife is a smart, funny, eye-opening tale of love, marriage, and the power of stories to unlock the true meaning of home and family.